A study published in February 2015 by the Journal of Clinical Psychiatry noted that depression is the leading cause of disability for U.S. adults ages 15-44 and results in nearly 400 million disability days per year. These statistics indicate that unmet behavioral health needs have a significant impact on our daily lives. Telehealth for behavioral health is sometimes referred to tele-mental health, tele-psychiatry, tele-behavioral health or tele-therapy. It allows immediate, convenient access to care, alleviating the overwhelming feelings that often accompany patients dealing with a behavioral health issue by stripping away the stigma of an in-person visit. For patients – tele-therapy is provided by high-quality, licensed clinicians, with the opportunity for specialized and multidisciplinary care. Not only is it more affordable than brick and mortar therapy, increasingly it is covered by major insurers. The easy access to multiple providers reduces the uncertainty and confusion frequently experienced when searching for a therapist, and eliminates the frustration associated with finding therapists who are not accepting new patients. Telehealth addresses longstanding problems faced by consumers of behavioral health treatment. For example, finding a therapist outside of business hours, when most working adults want an appointment, is very challenging. 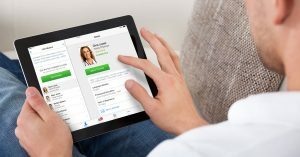 Through telehealth, employees can access therapists after work from the comfort of their own homes, via a scheduled or on-demand visit. For those individuals who still feel a stigma attached to therapy, telehealth provides a more private solution. 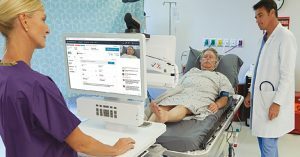 Telehealth has also been shown to decrease the cost of healthcare through reduced traveling costs, improved management of chronic disease, and shorter hospital stays and visits. American Well now offers online psychiatrists, in addition to psychologists and behavioral health therapists. Patients can log onto the Amwell app to find a psychiatrist that’s right for them, self-schedule appointments and experience our suite of coordinated care services. 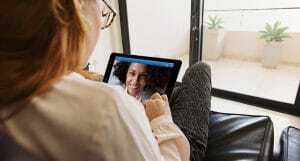 As employers, patients, health plans and hospitals experience the positive impact of greater availability of mental health services, telehealth as a solution will continue to expand and treat more patients.